Alter Experiences LLC was founded in 2016 by husband wife team Rami and Shantel, out of their passion for tourism, hospitality and environmental conservation. Spacious luxury bell tent glamping is roughing it with indulgence – everything you need is right here. Nightlife couldn’t be more exclusive with a spacious luxury bell tent with outside lights – glamping for everyone. 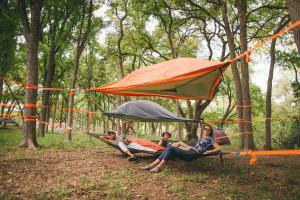 The tree tents are well equipped with blankets, towels, and sleeping bags included to comfortably fit two. 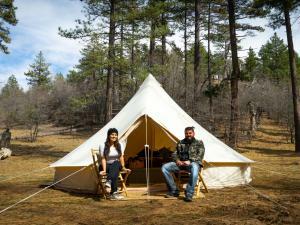 A peaceful and quiet weekend getaway is what you will get when you star gaze in your tree tent for two. The company is working on expanding the current glamping sites in San Diego, and they require a capital of $25,000 to obtain this goal. SAN DIEGO, CA, UNITED STATES, March 19, 2019 /EINPresswire.com/ — Alter Experiences LLC is an outdoor hospitality company and the only one of a kind outdoor glamping venue in San Diego. Utilizing Tentsile (tree tents), they have been providing people with a perfect get away from their bustling routines since 2016 at the most exotic sites nestled in the high mountain forests of San Diego. The Company is now taking its cause of promoting sustainable tourism in San Diego up a notch by setting up new sites in the back-country mountains of Cleveland National Forest. The plans for these developments are already in motion and include the setting up of 6-8 additional glamping sites throughout San Diego, CA. These sites, with an abundance of bio-diversity, wild-life flora and fauna, include El Prado/Laguna and Burnt Rancheria Campgrounds located inside Cleveland National Forest, as well as Fort Cross Old Timey Adventures in the heart of historic Julian. To meet their expansion goals on time and enable people to enjoy the divine beauty of these sites, Alter Experiences has set up a Kickstarter campaign. Alter Experience is hoping to raise $25,000 to outfit these new sites, and the pledging starts for as low as $10 and goes all the way to $5,000. 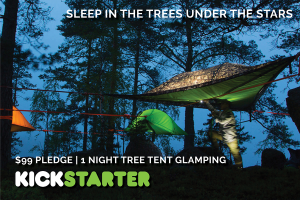 Each pledge offers a unique reward ranging from an exclusive thank you card from the company, commemorative bracelets, an invitation for a mountain party, to a one-night of tree tents glamping or luxury bell tent glamping and more. Everything from their expansion plans to the total budget of the project is already provided on their Kickstarter campaign page. Moreover, all the promotional rates offered in the campaign are on an average 30% OFF on the standard rates of the company’s packages. So besides supporting the cause of promoting sustainable tourism in San Diego, the pledgers of the campaign get the benefit of a HUGE discount as well. Furthermore, those supporting the campaign by pledging at least $99 or more will be the first ones to enjoy a memorable night in these new sites. All of the previous projects of Alter Experiences have been a massive success. 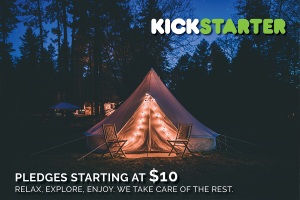 And now they are paving the way for the addition of new glamping locations through this Kickstarter Campaign. With the enormous support from people around the world, the campaign is close to achieving half of the amount out of $25,000. Alter Experiences is encouraging people to help them reach their goal before the deadline of March 31, 2019. To support their campaign, visit the Kickstarter page or to know more about the company, visit their website https://alterexperiences.com. Follow Alter Experiences on social media at Instagram @alter.experiences; Facebook at alterexperiences, Twitter @alterllc, YouTube and Pinterest.